Samsung kept the 5.1" screen diagonal from the previous Galaxy S, but stepped up the resolution to QHD (that's 1,440 x 2,560px). 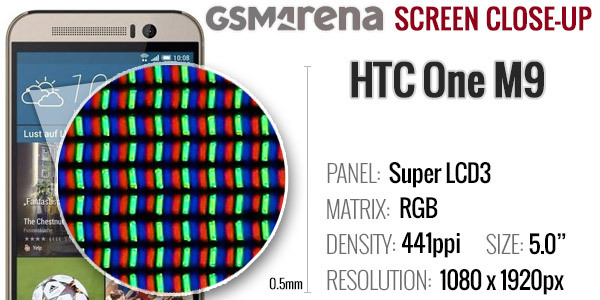 HTC kept the same IPS LCD - 5 inch in diagonal with 1080p resolution. Both displays are protected by Gorilla Glass 4. 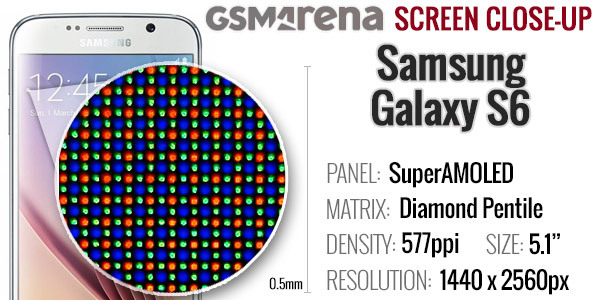 You may think that QHD is excessive, but Samsung's Super AMOLED has a PenTile matrix - that's two sub-pixels instead of three. This means the sub-pixel count is now roughly equal to a 1080p LCD so it does improve sharpness. The company has done more to improve the display quality. Since the Galaxy S5 it perfected color rendering (with minimal color shift due to viewing angle) and on the Galaxy S6 it pushed the brightness way up. 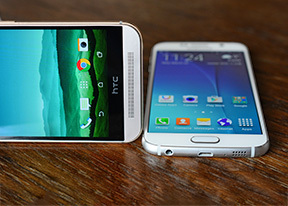 AMOLEDs used to be dark, but the Galaxy S6 display can reach 750nits - higher than the LCD of the HTC One M9. Note that this is on Auto brightness, when you set the brightness manually you can only push it up to 470nits. That's pretty close to the One M9's maximum of 530nits. 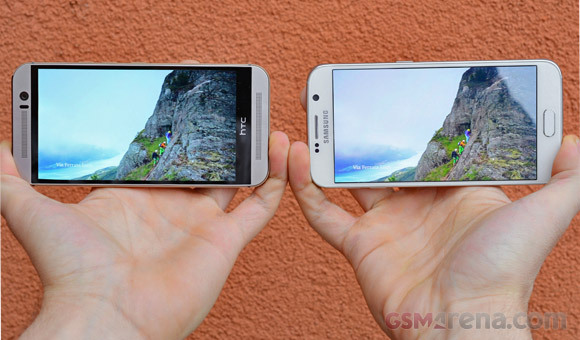 The HTC One M9 screen has vivid colors too and minimal color shifting when viewed at an angle. The contrast is excellent too, 1,200:1 across the brightness range and the blacks are pleasingly deep. The brightness slider is not linear though, the screen only puts out a third of its top brightness when the slider is in the middle. The screen is pretty reflective though, which keeps the sunlight legibility down to One (M8) levels. The Samsung Galaxy S6 on the other hand has one of the best displays in that respect. And this was with brightness set manually, the auto brightness has potential to offer even better legibility. Having mentioned colors, Samsung provides Screen modes that change the white balance and color saturation of the display to match your preference. Both the Galaxy S6 and the HTC One M9 feature a high-sensitivity mode that lets you operate the phone with gloves (great for winter times). Both phones can (theoretically) go up to 300Mbps when connected to an LTE network and they also support 42Mbps 3G. Both use a single nano-SIM card, with no official dual-SIM versions announced yet. Locally, both can hook up to speedy Wi-Fi ac (on 2.4GHz or 5GHz) and both have the latest Bluetooth 4.1 with apt-X for high quality audio streaming. The Galaxy S6 also has ANT+ for use with certain sports sensors. For positioning the Samsung supports a combination of GPS, GLONASS and Beidou (the Chinese system). The HTC One M9's specs page doesn't list Beidou even though the Snapdragon 810 chipset does support it. If you still listen to plain old FM radio broadcasts (as opposed to online streaming radio), the One M9 requires you to plug in a pair of headphones, while the Galaxy S6 does not support it at all. Both phones have IR blasters to control AV equipment at home. Surprisingly, both come with the Smart Peel Remote app, but you can always install a different app. Finally, for wired connectivity both have a microUSB port with MHL 3.0 for TV out and USB host for connecting peripherals. Winner: Tie. Unless you still listen to FM radio or have invested in ANT+ equipment there's no clear winner to be had between the two in the connectivity department as both cover the modern-day essentials and then some more. Update, April 3: we received a retail Galaxy S6 unit and re-ran our tests. 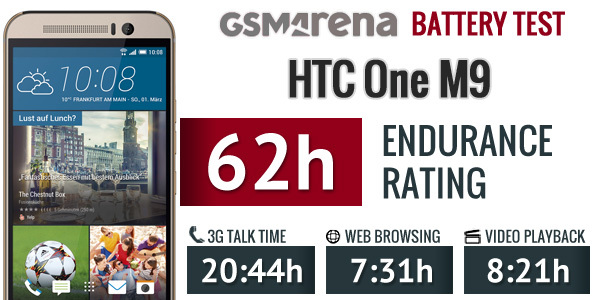 The battery life improved, pushing it above the One M9 . HTC managed to fit a slightly bigger battery in its new flagship (2,840mAh vs. 2,600mAh), while Samsung actually went down in battery capacity (2,550mAh vs. 2,800mAh). 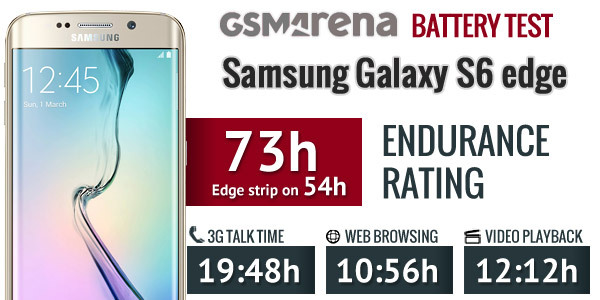 Yes, Samsung has wireless charging for quick top ups, but as we found in our review the Endurance rating of the phone tumbled down by 10 hours as compared to the Galaxy S5. This would have been HTC's chance to strike, except the One M9's Endurance rating is down 15 hours compared to its predecessors. Here's the thing, Samsung used its chip manufacturing prowess to bring the first 14nm mobile chipset to the market, while Qualcomm is still on a 20nm process. This has a noticeable effect in how much waste heat is produced by the chipset (this has implications for performance), but also impacts battery life. The Super AMOLED screen is also very efficient - despite the move to QHD and the higher brightness, the Galaxy S6 performed better overall. For the battery test we put the brightness slider at 50%, which translates to 208nits for the Galaxy S6 and 175nits for the HTC One M9. Even so the Samsung Galaxy S6 beats the HTC One M9 by at least three hours in web browsing and by four hours in video playback. It does lose in by an hour in the talk time though. Still, for a battery that's 250mAh smaller, the Samsung result is quite good. Also, there's a powerful charger in its box and a wireless charging option, while the HTC has none of those. Winner: Samsung Galaxy S6. Big wins in web browsing and video playback lead to a superior Endurance rating. The smaller talk time is not perfect, but we doubt you'll talk the battery dry. The more convenient charging methods also count for a lot. Both Samsung and HTC went back with their battery life, but at least the Galaxy has a thinner frame to show for it. The One M9 may be suffering from a sub-par chipset, we'll see in a bit.